Opera claims that a alpha or beta version will not interfere with a standard installation, but that’s mainly true for Windows. For Linux you have to be a bit more carefull, but still it’s easy. 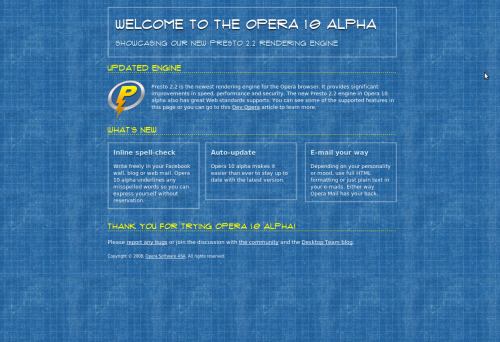 How do you install the latest Opera Alpha/beta version on a Linux/ Ubuntu box? The download page doesn’t offer the dedicated Ubuntu versions like it does for main versions. But don’t worry, it is easy. There a several version for download, for AMD64 bits for 64 bits systems or intel-linux for 32bits setups. Make your choice. Then you have to choose for different GCC and QT versions. GCC stands for GNU Compiler Collection the standard compiler for most Linux systems. QT refers to the LIBQT libraries. Qt is a cross-platform C++ application framework. Qt’s primary feature is its rich set of widgets that provide standard GUI functionality. You can check your versions in the Synaptic Package Manager and choose. I took the easy way: I simply downloaded the bundled version with the latest versions, and it worked. Don’t take the RPM or DEB’s packjages. They will be installed with installers like dpkg and interfere with your existing Opera browser. Choose the gz or bz2 packages instead. Download the packages to your home folder, extract, and run! That’s all! Opera runs just fine. And the new rendering speed is fast, really fast. I noticed that scrolling is not always smooth on complicated SVG pages, but hey, it’s a alpha. Webfonts are cool. Expect a demo here soon. This post shows some surprising differences in rendering quality from various browsers. It looks like Chrome is simply skipping some pixels and the rendering doesn’t seemed to be aliased. You can run the example demo in your own browser to see the results.